Click on the map below to find out the details in your location. If your town is included, an activity is planned or has concluded. If you have a report on a completed activity and it is not yet on the list, email us with the details so they can be published. The 31st May is the anniversary of the signing of the Treaty of Vereeniging that ended the South African War in 1902. Boer War Day itself is held on the Sunday before 31<sup>st</sup> May or near thereto to enable working people to attend. In Adelaide on 26 May 2013,we were blessed with fine weather. The service once again held at OUR MAGNIFICENT MEMORIAL !! Which is in the CBD outside Government House on a busy intersection opposite Parliament House. Amongst those gathered were: Frances Bedford MP representing The Premier of South Australia; Hon Jing Lee MLC representing The Leader of the Opposition. In procession from the Torrens Parade Ground and arriving at the Memorial were: Scots College Pipers; Barossa Light Horse Historical Association and Three Newfoundland Dogs Representing "Nelson" mascot taken by the troops to South Africa. The Service featured: the Padre - Rev Garry Prince; Bugler - Major Colin Smith of the Salvation Army Band; The Ode, recited by Brig Laurie Lewis AM; and the Scots College Pipers played a lament. Tributes were placed by many,including one by Monty Smith for the Transvaal Nurses. It was great that many Descendants placed tributes in memory of their forefathers. It was excellent to have some Sons and Daughters of Veterans with us. The committee are sure that in excess of 200 were in attendance at the Boer War Memorial. Some travelled from all parts of South Australia to be with fellow descendants. After the service, refreshments and fellowship were taken of at Torrens Drill Hall, Torrens Parade Ground a sacred place as Troops assembled there before sailing to South Africa. After the commemorative service at the South African War Memorial, Boer War Veterans' descendants and many others gathered In the Torrens Training Depot Drill Hall for refreshments and they were treated with a display of the Guidons of the 3rd/9th Light Horse (South Australian Mounted Rifles) and the Colours of the Royal South Australian Regiment (held in custody by 10th/27th Battalion). In addition, the Guidons were formally paraded into the Drill Hall and later out of the Drill Hall while everyone was present. The feedback received from those present about having the Guidons and Colours there on the day was most favourable. We thank: the State Branch of the RSL; Veterans SA; History SA; ABC Radio; the Sunday Mail; the Adelaide City Council; South Australian Police; and Government House. It was planned to hold a Boer War comemoration on Sunday, May 26 commencing at 11:00 at the Bathurst Boer War Memorial in Kings Parade, William Street, Bathurst. A report on this activity is awaited. The Boer War Day service was to be held at the RSL Rooms, on Sunday 26 May at 11am. Hosted by the Blayney Shire Local and Family History Group and the Blayney RSL. All were welcome to join in. A report on this activity is awaited. On 2 June 2013, about 50 people attended a National Boer War Memorial Association service for Lt Col Harry Vialls. The Rev Don Cannon (Anglican Minister) conducted prayers, we ask Don because Harry was buried by Rev Davis in 1918 in the Anglican area of the Cemetery. The Bridgetown RSL sub-Branch Vice President welcomed everyone and gave a brief overview of the Boer War then Peter Lamb was asked to speak on the background of Harry and his exploits during his service in South Africa. A wreath was laid and the Bugler then played and the Ode was said. Anzac Square, Brisbane at Boer War Memorial (the QMI Lighthorseman Statue). Under clear skies the Boer War Memorial Association in Queensland celebrated Boer War Day 2013 with an attendance of 80 people, starting with a Blessing by our Hon. Padre, Fr Geoff Reader. The focus this year was on Descendants and Supporters, including Descendant Mrs Jane Prentice MP, the Federal Member for Ryan (Indooroopilly area). Also in attendance was Mr. Terry Meehan, the State President RSL Queensland accompanied by his wife Sue, Mrs Alison Stanley the Deputy Commissioner DVA Qld and Councillor Nicole Johnston from Brisbane City Council. Student groups from both Corinda State High and Aspley State High attended and laid wreaths. Year 12 high school student, Lukas Vanags from St Peters Lutheran College, sounded Last Post and Rouse magnificently. LTCOL Miles Farmer OAM (Rtd) gave the keynote address on the signing of the Peace Treaty giving first hand experience having visited Melrose House in South Africa. Qld Committee Chairman, LTCOL Ron McElwaine OAM RFD ED (Rtd), presented and original early 20th century Lithograph titled "Lord Kitcheners Home Coming" to CAPT Adele Catts the Curator of the 2/14 LH (QMI) Museum. A delightful morning tea followed at the nearby United Service Club. On Thursday 31st May 2013 at 02.00 PM, the Reverend Paul Black and the ACT NBWM Committee conducted the second yearly commemorative service at Saint John the Baptist Anglican Church, Reid which is located directly behind the NBWM site on ANZAC Parade. This service is to pay tribute to all Boer War Veterans who served in the conflict to express "Praising what is lost - makes the remembrance dear". It is also to specifically remember two local volunteers who are commemorated at the church. These were Sergeant William Bradshaw Galliard Smith of the 2nd Scottish Horse who was the second son of the Reverend Pierce Galliard Smith MA, Minister of St John the Baptist's Church for thirty-one years. He was killed heroically at the Battle of Brakenlaagte on 30 October 1901 and Private William Frederik Young of the 1st Australian Horse who died of disease at St Vincent's Hospital Sydney. He had been wounded in South Africa and contracted enteric fever. Floral tributes were laid on the altar of the church and the grave of Private William Frederik Young. During the Service and at the graveside Mr Geoff See of the Queanbeyan City Pipes and Drums played and the haunting music of the pipes filled the church and churchyard. An increased number of descendants attended this year including Mr Rob Howse, the grandson of Major General Sir Neville Reginal Howse VC KCB KCMG and Mrs Adrienne Bradley, a direct descendant of Sergeant William Bradshaw Galliard Smith. Mrs Betsey Boundy, the daughter of Sergeant Henry Clifton Prosser, Fourth South Australian Imperial Bushmen was present and is a parishioner of Saint John the Baptist Anglican Church. A New South Wales State Flag donated by the Hon. Barry Robert O'Farrell, MP, Premier of New South Wales and taken to South Africa in 2012 and unveiled at significant NSW Battle fields such as Belmont and Koster River was placed on the altar during the service. The image above is a photograph of attendees from the Commemorative Church Service held at St John the Baptist's Anglican Church, Reid Australian Capital Territory on Friday 31 May at 2:00pm - of interest is Mrs Betty Boundy the daughter of Sergeant Henry Clifton Prosser, Fourth South Australian Imperial Bushmen and a parishioner of Saint John the Baptist Anglican Church (fourth from the right) and Mr Robert Howse, the grandson of Major General Sir Neville Reginal Howse VC KCB KCMG standing behind the lectern (first from right) the daughter of Sergeant Henry Clifton Prosser, Fourth South Australian Imperial Bushmen was present and is a parishioner of Saint John the Baptist Anglican Church. Fifth from the right is Mrs Adrienne Bradley, a direct descendant of Sergeant William Bradshaw Galliard Smith, 2nd Scottish Horse. At the conclusion of a moving service the ACT NBWM Committee then proceeded to the Australian War Memorial where a special anniversary closing ceremony was held to commemorate the 111th anniversary of signing of the Peace treaty at Vereeniging in South Africa on 31 May 1902. This was held in the commemorative area of the memorial at 5.00 PM and consisted of a short anniversary address featuring the biography of Trooper John Waddell, NSW Imperial Bushmen who was killed in action at the Elands River on 4 August 1900 and received a Mention in Despatches for his conduct during the siege. Wreaths were laid by ACT NBWM Committee and descendants such as Mr John Howse, another grandson of Major General Sir Neville Reginal Howse VC KCB KCMG and Ms Dale Liepins. The ceremony concluded with the sounding of the Last Post. There were many Queen's South Africa Medals and King's South African Medals being proudly worn by descendants in the audience. A Boer War Service was to be held in Clarence Town NSW at the Boer War Memorial on the gates in Queen Street which is entry to the football field on Sunday 26 May 2013 at 10:00. A report on this activity is awaited. Eugowra was to have a Boer War Memorial service and tree planting to honor, especially the Eugowra men, but also all who served in the Boer War. The Memorial Ceremony was to start at 11:00 on Sunday 26 May 2013 in the Eugowra Memorial Park. A report on this activity is awaited. Gosford held its first Boer War Commemoration Ceremony in the Memorial Park Mann St Gosford at 1.30 pm 30th May. The organiser was Kay Williams who received strong support from Gosford RSL Sub Branch, Gosford City Council, Gosford Public School and the Department of Veterans Affairs NSW. Kay Williams MC'd the service, Gosford Public School Band provided the music. The Commemorative address was given by Lt Col D J Deasey RFD from the NSW NBWMA Committee. Fr Rod Bower from Gosford Anglican Church read the prayers and led the singing of the National Anthem in a stirring fashion. About 200 took part including students from Gosford Primary School and their parents, Members of the community, Descendants and representatives of ex Service Organisations, Legacy etc attended many laying wreaths. NBN Newcastle attended as did representatives of local papers. After the service Gosford Public School put on afternoon tea for all who wished to come back to the school. The staff and students were proud to show all visitors the unit of work on the Boer War that was being completed by some of the classes. The assembly hall and class rooms showed the huge effort put in to this exercise. The unit includes an interactive whiteboard program. The unit was created by the school's Assistant Principal, Ms Jenny Newton. A Goulburn Commemorative Ceremony was conducted at the Boer War Memorial in Belmore Park on Sunday 26 May at 11:00am. This was the first time that such a ceremony has been conducted in Goulburn, New South Wales for over a century. It was attended by about 40 people who gathered to pay tribute to the estimated 130 men of the Goulburn district who served in the Boer War. The ceremony was attended by a number of local dignitaries including Mayor Geoff Kettle, who read the Boer War Day 2013 Message from the Governor General, Lieutenant Colonel Peter Morrissey representing the Regimental Council of the Royal New South Wales Regiment and the ADF who read the Boer War Day 2013 Message from the Chief of the Defence Force. The Reverend Norman Wakefield recited the 23rd Psalm and prayed for the fallen and Mr Alby Schultz MP, the Member for Hume spoke about the local men who fought valiantly in the war. The Chairman of the ACT Branch of the NBWM Association, Mr Nigel Webster was the Master of Ceremonies and also gave the welcome address and provided a history of Australia's first overseas military action as a nation, which spanned from 1899 to 1902. He commented that "Australians played an active and vital role, disproportionate to their numbers, and they should not be marginalised in our history". Wreaths were laid by the representatives of federal and local government, the ADF and ex-service associations so the memorial was again used for its intended purpose of the remembrance of military service in a hard fought war. The Goulburn RSL Sub Branch now plans to turn Boer War Remembrance Day into an annual local event. The RSL Goulburn Sub Branch President Mr Gordon Wade was pleased with the turn out and said for too long the conflict had been a 'forgotten war' and that it was up to us to ensure the younger generations remember the sacrifices of their fellow countrymen all those years ago. The tenth annual BOER WAR COMMEMORATIVE DAY held Sunday 2nd June 2013 was, according to organiser, Reg. A. Watson, the "best of the best". The ceremony which is held at the impressive Boer War Memorial on Queen's Domain, Hobart is to honour "those Tasmanians who served" during The Anglo-Boer War (1899-1902) in South Africa. Mr Watson said a highlight of the ceremony was the playing of the Tasmanian National Anthem which was performed by the Clarence City Band. "It was perhaps the first time in 115 years that it had been played," said Mr Watson." and I have to say that it was very pleasing and beautiful." During his address, Mr Watson made the point that up until federation Tasmania was really an independent country and most of those Tasmanian soldiers who left our shores to go to fight went as Tasmanians, so that the playing of the anthem was very apt. The ceremony was the first time that the Lord Mayor of Hobart attended beside representatives of the State Government and Opposition. Mayors of Clarence and Southern Midlands also attended all laying a wreath. A number of the public did so as well while a Lone Piper played a lament. Members of the SS Militaria Collectors Tasmania and the Tasmanian Rifle Regiment fired a salute while a Member of the Tasmanian Light Horse played the Last Post and the Rouse, after a minute's silence. Chad Sutton Lt-Col Retired was MC. Cadets of B Coy Tas AAC Btn were on guard. "The weather was fine and it went off without a hitch," added Mr Watson. "Next week we go to Launceston to repeat the ceremony which will be held at the Boer War Memorial, City Park at 12 noon." The City of Launceston RSL Band will be playing airs and the northern MC will be Dr Frank Madill. Tasmania was the first State to hold such an event and it has been followed suit in other cities, such as Melbourne and Sydney and other centres. 26 May, 11 am Railway Square War Memorial. A report on this activity is awaited. On Sunday 9 June 2013 the annual Boer War Commemorative Day was held in the northern city of Tasmania, Launceston. The ceremony was held in Launceston at the Boer War Memorial, City Park. Again the weather was fine and public attendances more than pleasing, added Mr Reg Watson, Organiser. Tasmania was like a country in 1899, just before federation; we were truly independent and organised our own defences, especially after the British forces left Tasmania in1870. There was keen interest in the local militia, so much so, that when war was actually declared 11 October 1899, it was only after a fortnight that the first contingent under Captain St Clair Cameron left our shores. Three months later a draft for the Tasmanian Contingent also left. The Tasmanian contingent lost a number of troops: Bailey, Barker, Betts, Black, Button, Gilham, Butler, Galvin, Pitt, Doolin, Jacson. There were to be another six drafts from Tasmania to South Africa resulting in the deaths of Sale, Walter, Lette, Brown, McLaren, Wadley, Weber, Waburton, Orr, Lyne, Phegan, Cowell, Huttley, Fizallen, two Morrisbys (cousins), Cundy and Hodgman. This then, is the reason why we gather today, to honour their memory and the others who served and those who were wounded. Looking back now from a very changed Tasmania, we may not fully understand nor comprehend what prompted these young men - over 860 of them - to leave their comfortable home to fight for a cause, which maybe (but this also could be unkind) they did not fully understand; perhaps they really did not care, because the whole affair did smack of adventure. The City of Launceston RSL Band played Edwardian airs and the northern MC was Dr Frank Madill. Mr Watson has also announced that Dr Frank Madill has accepted the invitation to be patron for the Boer War Commemorative Day. Dr Madill is a well known identity in the northern city. With Frank Hesman AM JP The Boer War Commemorative Day now has two patrons, one from the south and one from the north of the island. The Launceston ceremony in 2014 will be held in the last Sunday in May instead of the usual second Sunday in June. This is to avoid the clash of the Queen's Birthday long weekend. It is hoped by this move, even more of the public will attend. The Lambton - New Lambton RSL sub- branch of the held its fourth Boer War Commemorative Service at the Lambton Bowling Club on 31 May, attracting an increasing number of attendees from public and other RSL sub- branches. Our theme this year, with 2013 being the Centenary of the Royal Australian Navt, the significance of the naval contribution to the BW by the parent Royal Navy. As with other remembrance ceremonies we conduct, we try to attract the interest of the local schools and involve them as participants. This year, students from Lambton, New Lambton and Carrington Public Schools, St Theresa's Catholic Primary, and Lambton High School. Two of the High School Captains shared a reading pertinent to the Royal Navy's involvement in the war, whilst the senior choir from New Lambton Public School sang us a song appropriate to the occasion. Following the service light refreshments were served and there was much social interaction between all present. 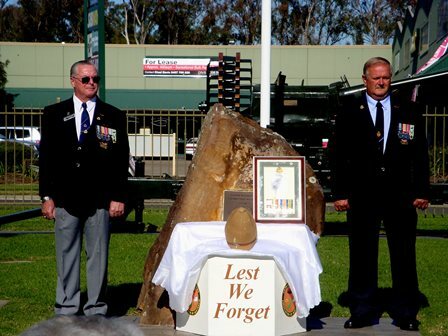 Maitland RSL Sub-Branch was to hold a Boer War Commemoration Service on Sunday 19 May 2013 at 9:30 for 10:00 start. The Service was be held at the Boer War Monument in Maitland Park. Morning tea to follow at approx 10:30 - 11:00 when the Sandakan Memorial Service will be held at the nearby Sandakan Memorial. A report on this activity is awaited. Saturday 25 May 11.00 am at Redmond Oval, with a contingent of Army Cadets and the Canobolas Pipe Band, service personnel and the Millthorpe Public School. Contact Robin Oates 6386 7233. A report on this activity is awaited. The 2013 Boer War Day Commemorations in Victoria commenced on Wednesday 22 May with a Civic Reception for first generation descendants of Boer War veterans. We have knowledge of 41 in Victoria but they are well advanced in years and most are unable to travel far. However, we did have 15 of them at the Town Hall and the event was a great success. A professional photograph was taken of the 15 and all have been sent a print for framing including a title slip with names etc. The Lord Mayor of Melbourne attended the function and it was excellently managed and catered for by the Melbourne City Council. Except for a let down by the caterer the Boer War Day service on Sunday 26 May was possibly our best yet. The weather was good and set the day off nicely. The ceremonial duties - catafalque party etc. were this year smartly handled by the Australian Great War Association and we were again well supported by the Creswick Light Horse and the Victoria Police Pipe Band. As in other years the service concluded with a 3 shot cannon salute. The cannon was supplied and ably handled by the Historical Re-enactment Society of Australia members dressed in Boer War period uniforms. The short oration was delivered by Major General Jim Barry and this year highlighted the epic Defence of Elands River from 4 to 16 August 1900'. In an effort to increase youth involvement during the service an incentive was offered to scouting and guiding groups. Certificates are now being issued to all scouts and guides who attend in uniform and, any group represented by 6 or more was presented with a special framed certificate. As our service is closely tied to heritage values of the scouting and guiding movement this struck the right chord. The result this year was that we had 95 members of these groups attend in uniform. As always many of them are able to also assist with the event in many ways, We are looking to increase this involvement next year and in the future. We are grateful to the Victorian Veterans Unit (Department of Premier and Cabinet) and the Department of Veterans Affairs for their assistance with funding for this event. 11:00 h Friday 31 May 2013, at the Alan Border Oval site of the Mosman War Memorial. Delivering the Boer War Day commemoration address, Col Wright reminded the more than 50 people - including one first-generation descendant and five other descendants of Boer War veterans - gathered at the Mosman that the name "ANZAC" was born in the trenches at Gallipoli to stand for sacrifice, courage and mateship of Australians and New Zealanders. However the men and women of both countries, side by side in action 12 years earlier in South Africa, although embedded in larger British columns, distinguished themselves with the same qualities. Similarly the term 'Diggers', the origin of which is contentious but was certainly earned in the military necessity at the Australian soldiers' defence of the Elands River Stockade in August 1900, as the flat open ground, offering no shelter to man or beast, came under attack for 12 days by a much larger and better armed Boer force. Here they doggedly rejected two offers of a truce. Lt Col Ian Henderson (Ret'd), President of the Mosman RSL Sub-Branch conducted the ceremony, introducing the Secretary Maj Eileen Henderson RFD (Ret'd) RAANC to speak about the Boer War nurses, the first Australian women sent to a war. Prayers were led by Mons Eugene Harley, the main address given by Col Lawrence Wright AM (Ret'd). "For the Fallen" spoken by Cr Roy Bendall the Deputy Mayor of Mosman. Lt Col Ian Henderson himself delivered the Ode before he introduced Lt Col Tony Larnach-Jones, Chair of the NSW committee of the National Boer War Memorial Association to outline the Association's progress towards its objective of having the national memorial built and dedicated by 25 April 2015. Mosman RSL Club invited all back for light refreshments which had been provided by the Rotary Club of Mosman. 26 May, 11 am, Sandgate Cemetery. A report on this activity is awaited. On Sunday 26 May 2013 at 4pm, a service was held at the Boer War Memorial in Rauch Park in Nowra to commemorate Boer War Day. This is the 4th such commemoration in Nowra. Over 40 people attended the service, with military representatives, local dignitaries as well as many sub-branch members, members from local veteran organisations and the descendants of Boer War veterans. Chaplain Lt. Dominic Wallis conducted the service, and many wreaths were laid in remembrance. A receptive audience assembled Orange's Boer War Day commemoration ceremony. Organised jointly by Cr Reg Kidd, an Orange City Council officer Ms Alison Russell and Mr Les McGaw, Orange RSL Sub-Branch, the sun shone on the beautiful Boer War Memorial. It has had a chequered history: first erected in Summer Street and unveiled on 29 March 1905 by Brigadier General Gordon. Strangely the date the Boer War is said to begin is in 1898, rather than the usual 1899. In his address, Cr Kidd challenged the people present to discover the reason. The Memorial was later moved to Robertson Park. Near it now stands he Sir Neville Howse VC Memorial, designed by Orange artist, Les Quick, and unveiled in 2000, with panels representing three aspects of Howse's life: his Boer War military service in South Africa where he won his Victoria Cross, and his contribution again in WW1, his medical career and his community contribution at all three levels of government. "Those who desired to live went out to death. Dark underground their golden youth is lying. We live and there is lightness in one breath. They could not know the splendour of their dying." Battle of Wagon Hill, 6 January 1900. Exhibition covering all the conflicts the Royal New South Wales Lancers have been committed to, including the Boer War where it was the first Australian unit in action, 10:00 - 16:00 New South Wales Lancers' Museum, Parramatta Sunday 9 June 2013 Moved from 2 June 2013 by direction of the Department of Defence. At 11:30 there was an illustrated lecture/presentation on visiting the Boer War sites in South Africa in the Lancer Barracks Drill Hall, sponsored by Military History Tours, Australia. Only a few attended, it proved a great opportunity for those tracing their Boer War relatives to get some expert assistance. The Commonwealth wreaths were laid by ADF Officers from the Navy and ARMY. HMAS Stirling provided the catafalque party. When your country is attacked, you defend it. My maternal grandfather was a Scot, taken as a baby to Africa. John Campbell grew up as a burgher (citizen) of the Orange Free State. His first child, my mother May Campbell, was born on 24 September 1898, in a small Free State dorp, Vrede. War came in 1899. Britain discovered that their superior forces could not compel the Boers of both republics to surrender; even after both capital cities had been occupied! Lord Kitchener then ordered all Boer farm houses to be burned down and cattle and sheep slaughtered. Women and children were abandoned in the biting frosts of winter without shelter or blankets. European powers railed against such brutal treatment of non-combatants. The British responded by emulating the Spanish in their struggle against rebels in Cuba. Concentration camps were established across the Transvaal and Orange Free State. Verdwyn soos voor die son die wolke." As the sun, the clouds disappear." We strive for a more peaceful future. An Irishman made a life in a new country, the Orange Free State, and fought to defend his successful business from invaders. A young New South Welshman volunteered to serve his colony by sailing off to war. They never met but symbolise an old story of mankind. Samuel James Heathwood was born in 1883. Sometimes known as 'John', he joined the 3rd Contingent of the New South Wales Imperial Bushmen. He sailed from Sydney on the Armenian on 23 April 1900. He was only 17 years old. It was an adventure for a youngster, with likelihood of fighting against a strange peasant foe. George Walter Ross was born in Ireland on 12 November 1867, ran away from home in 1882. He called himself 'Arthur' to make it more difficult for his father to find him. He was known to his friends and enemies by that name. When war broke out in October 1899 he was 32. As a burgher of the OFS he must have decided to defend his business, joining a Commando (the local militia). Alan and Brian joined others laying Reconciliation Wreaths. A Queanbeyan Commemorative Wreath Laying was conducted in Queanbeyan Park, Queanbeyan, New South Wales on Saturday 1 June at 11:00am. This is the first time that a specific South African War ceremony has been conducted for many years and proceeded in the face of rain and overcast skies. The Queanbeyan District sent 51 volunteers to the South African War of whom five made the supreme sacrifice. The site was in the vicinity of the Queanbeyan Boer War Memorial which was erected in 1903 and is one of the earliest South African War memorials in New South Wales. Originally of sandstone it was first placed at the intersection of the two main streets, Crawford and Monaro, in the middle of the road. A gas vapour light at the top, fuelled from an underground tank, made it the only street light in the town after 9.00 pm for many years. After some unfortunate accidents involving motor vehicles over the years it was both reconstructed and moved a number of times. With increasing traffic and the growth of the town the memorial column was considered a traffic hazard and was moved to its present location in 1964. The Chairman of the ACT Branch of the NBWM Association Mr Nigel Webster was the Master of Ceremonies and gave the welcome address and said that Peace came after 32 weary months of hard fighting and that the Australian contingents played a major role in achieving that result. The Hon Dr Mike Kelly AM MP Federal Member for Eden spoke of the historical legacy of the South African War for both the Australian Defence Force and the Australian Government. He also spoke of the contribution made by many local volunteers from the region who volunteered for service in South Africa. Wreaths were laid by Hon Dr Mike Kelly AM MP, Councilor Tim Overall, the Mayor of Queanbeyan and the ACT NBWM Committee. This posed a challenge as the current location of the Queanbeyan War Memorial is on a traffic island in the middle of a Lowe Street so the official party had to time its procession across the road against oncoming traffic! It certainly made a convincing case for the ACT NBWM Committee's campaign to move the memorial into Queanbeyan Park. Mr Geoff See of the Queanbeyan City Pipes and Drums provided the musical accompaniment on the bagpipes. This ceremony though small in numbers in 2013 will grow in popularity as it continues in the years to come. The war memorial at Ryde Park hosted is first recorded memorial service on Friday - for Australians who lost their lives in the Boer War of 1899-1902. 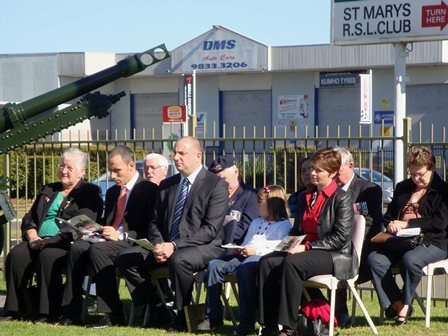 The memorial service was the initiative of Ryde District RSL Sub Branch President Bernie Cox with the support of Ryde MP Victor Dominello. It was also attended by Marsden High School's new principal Gus Vrolyk, student representative council members Luke Cramp and Luci Monk alongside the Treasurer of the Ryde District RSL Sub Branch and Director Club RydeX Tony Bonvino and the Ryde District RSLSub Branch enthusiast Rebel Holroyd. The President of the Ryde City Concert Band Philip Ward played the Last Post. Mr Dominello spoke about the importance of recognising all lo- cal servicemen and women who have made the ultimate sacrifice in time of war. Mr Vrolyk said Marsden High has a proud reputation for his- tory and the commemoration of Australians at War. It recently hosted speeches by local war veterans as part of a TWT initiative in partnership with Mr Dominello's office. Mr Cox praised the students involvement and their interest in the Boer War and other defining moments in South Africa's history. Around 16,000 Australians fought in the Boer War; 282 died in action and a further 286 died from disease. Six Australians received the Victoria Cross in South Africa. Report courtesy "The Weekly Times"
On a bright sunny Autumn morning, 54 folk came together at the guns memorial of St Marys RSL Club on Sunday 26th May 2013, to pay homage and remembrance for those who participated in Australia's first conflict, the 2nd Anglo-Boer War of 1899-1902. In a brief Commemorative Service, we heard poems from Banjo Patterson ("Moving On" - presented by Leslie Ayres and George Evans ("Elands River" presented by Reno Ciantar), the later poem providing a graphic description of this major battle in 1900 where the Australians were up against eight times their number in a drawn out conflict over 12 days. Ted Fish was again our excellent MC and Tony Fryer presented an overview of Australia's part in the War, finishing with a recent relevant quotation from our Governor General in reference to the Elands River battle. Local MPs David Bradbury and Tanya Davies were accompanied by a number of descendants of Boer War veterans, as well as patrons and members of the St Marys RSL Sub-Branch, their families and other interested folk. Whilst a very different format to those services associated with ANZAC, the same respect and reverence was paid by those participating. The Sydney Boer War Day commemoration was held at the ANZAC Memorial, Hyde Park South, Sydney, Sunday 26 May; Commencing at 11.00 am. It comemorated the 111th Anniversary of Signing the Vereeniging Peace document at Melrose House, Pretoria, and remembering the defence of Elands River Staging Post. Her Excellency, Professor Marie Bashir AC CVO addressed a record turnout of 360 people attending the commemoration in front of the ANZAC Memorial in Sydney. Students, including cadets, from several schools and colleges joined federal and state ministers and members, Sydney City Council members, representatives of all three armed services and ex-service associations, the RSL, War Widows, Legacy, DVA, Rotary with Descendants of Boer War soldiers and nurses and the public at large to participate in this year's remembrance ceremony for the Boer War fallen. The NSW committee of the National Boer War Memorial Association were pleased to welcome a representative of the Rhodesian soldiers who served, especially since we are also remembering Australia's role in the defence at Elands River, which we shared with Rhodesians. Also particularly welcome were members of the South Africa Military Volunteers Association of Australia, with representatives of both sides in the Boer War 1899-1902. General Peter Cosgrove, AC MC, delivering the Commemorative Address, reviewed the Boer War from a military perspective, reflecting on the equal qualities of the Australian and Boer soldiers. He summarised the Australian/Rhodesian defence of the Elands River Staging Post, its importance in our military history and foretaste of what was to come just 14 years later. Though in colonial times there had been some military action it wasn't until the Boer War that Australia fielded a major force and demonstrated the qualities that would become famous in the Great War. In his Epilogue to the ceremony, Chairman of the NSW BWM committee, Lt Col Tony Larnach-Jones, thanked NSW Minister for Veterans Affairs, Mr Victor Dominello, for his active support in NSW, this year in centres including Ryde, Bathurst, Blaney, Eugowra, Goulburn, Clarence Town, Lambton, Maitland, Millthorpe, Orange, and Windsor for example. It was hoped that next year there would be similar commemorations of local Boer War veterans in Newcastle, Wollongong, Parramatta, Armidale and Wagga Wagga. He finished his address with the latest news on the national memorial, thanking everyone for their donations to date, enabling the sculptor to continue work on the four mounted troopers, and asking governments and the private sector to contribute to the brilliant piece of contemporary art to ensure its completion before the ANZAC Centenary. Welcome contributions to the service came from Chaplain Lt Col Colin Aiken OAM RFD, Bugler Musician Malcolm Ramsay of the 1st/15th Royal NSW Lancers, the Scots College Pipes and Drum band, Dominic Canturi of St Aloysius College and Pola Cohen of Sydney Girls High School. CLICK HERE and HERE for more photos of the Sydney comemoration, taken by Peter Butterworth. A small group of us gathered at our Memorial and held a short service in which we laid a wreath on Sunday 26 May. Our Sub Branch also recently made a donation of $200 to the Memorial in Canberra. Not many of us but we do Remember. The North Queensland Historical Re-enactment Society Inc was to commemorate Boer War Day on the 26 May 2013 at the Army Museum of North Queensland (Jezzine Barracks) Townsville. A report on this activity is awaited. About sixty stood in front of Hawkesbury's Boer War Memorial at Windsor, bathed in bright sunshine, the air unseasonably warm, to commemorate the Boer War (South Africa 1899-1902) soldiers and nurses who served and especially those who did not return. The Windsor RSL Sub-Branch hosted the district's service on the actual anniversary of the day the Peace Treaty was signed, 31 May 1902, as it has every year, to claim something of a record. MC Leon Walker, Honorary Secretary of the RSL Sub-Branch was MC, introduced sub-Branch Vice President Jim Davey for a Prayer of Remembrance, RSL Club President Col Wilson to read a poem Epitaph for a Soldier (David McNicholl 1941), Rob Burke a Prayer for the Nation, Jilly Warren to read a little-known poem by Boer War correspondent Banjo Paterson The Admission, sub-Branch Womens Auxiliary Vice President Elizabeth Davey a Prayer for the Defence Force, and Geoffrey Brand to give the Boer War Commemorative address. Everyone present was invited to the Windsor RSL Club for light refreshments and a great deal of good conversation. Representing the RAAF - Squadron Leader Peter Tame. Peter is the Great Great Grandson of Boer War Veteran Farrier Sergeant Albert Edward Tame 3618 of 3 NSW Imperial Bushmen. Albert was one of four brothers who all served in the Boer War in the NSW Imperial Bushmen.The others were Henry Tame 3616, Herbert Tame 3692 and Walter Tame 3617. These three died of "Enteric" in South Africa. 26 May approx 11 am Wollongong Cenotaph, following meeting of the National Servicemen's Association. Young 11 am Anderson Park Cenotaph, As well as a public invitation to this first Boer War Day ceremony in 100 years, RSL Young Sub Branch President John Walker extended a special invitation to the descendants of all Boer War veteran soldiers and nurses as well as those who support the need for a national Boer War Memorial on ANZAC Parade. Descendants were to wear their BW veteran's medals on the right, their own on the left of course. Commemorative medallions on their neck ribbon. A report on this activity is awaited.